AV Direct along with Julie Killias Events were awarded the production for this magnificent wedding at Delaire Graff Estate in Stellenbosch. The production would consist of several months of preparation for an event of this magnitude. All technical elements, pre-production of fabrics, sets and entertainment aspects were handled by our staff. Let us take you through the production process step by step! The planning and pre-production phase for the wedding was the most exhilarating and exciting of the whole function! You can just imagine. Several site meetings had to be conducted for the layout of the land, technical layout of equipment which included the outside ceremony, reception area’s and fireworks display area’s. Security details were confirmed for the international artists performing and with decisive discussions regarding musical equipment and hospitality. A 3D graph for the entire venue was created and a full 3D video edit of the details for the technical layout was handed to the client. Once the fabric and designs had been chosen for the set and stage backdrops, we went ahead and manufactured over 200m of stage flats and applied the beautiful damask fabric. Below you can see the designs which were chosen to be attached to the sets. These designs were printed on vinyl and applied to a perspex decal which included LED lighting to give a beautiful glow to the set. The designs were also printed and applied to the dance floor which was constructed using white gloss sheeting. Once the stage design and technical layouts had been approved, our team got together to discuss the setup times and logistics for the event. Specifically coordinated by Julie Killas Designs, all suppliers were responsible to adhere to a strict setup schedule. We had 3 large trucks and 2 other vehicles packed and ready to go! The setup took place 5 days before the wedding date to ensure that all procedures and technical aspects of the event were checked, tested and double checked! For the ceremony and outside areas we setup sound and lighting systems. Carol Thorns performed for guests inside her amazing “Cellosphere”! At the walk-in area we setup sets and added lighting to give off a stunning glow. The area was also cordoned off for the pyrotechnic equipment which would be used later that night. We setup our generators and equipped power distribution to all area’s including the caterer’s kitchen, ceremony and reception area’s, back-of-house area and artists quarters. Over one thousand eight hundred shells would be let off during the celebrations! AV Direct took measures to inform security and police of the display which could be seen for miles around the “Helshoogte” mountains! The setup inside started with the rigging of steels and safety fixtures inside the roof of the marquee. Beautiful chandeliers, flower arrangements, trussing and moving head lights were all installed. The flooring could then be completed with over 150m2 of white tempo-tile flooring and under-flooring used to create a stable foundation for the reception. We then added in the staging requirements and sets. A manufactured DJ booth was used for the event which combined classy damask fabric with a perspex vinyl cut-out of the couple’s initials. This booth was constructed and assembled in-house with LED lighting and DMX controllers attached. The stage was clad with white gloss sheeting and with sets created to neatly house the lighting fixtures around the stage area just looked amazing! To add to the beautiful aesthetics of the venue, we constructed steel pipes to be hung in the ceiling for our LED fixtures. These were neatly covered with draping so that just the lights could be seen. We setup to have a LED light per each table in the venue. You can see the effect created in the pictures below. Local and international artists were asked to perform at this Wedding and that meant booking the correct back-line equipment for the day. This ensured a seamless transition would take place between the performances. 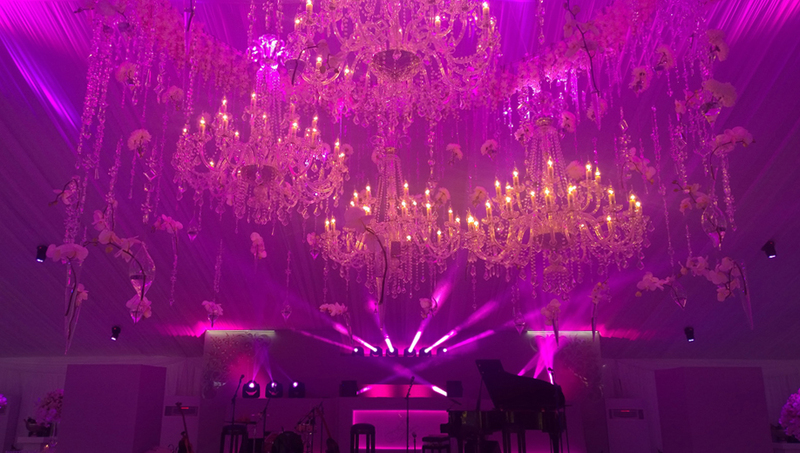 For John Legend, a beautiful baby grand piano was delivered and tuned at the venue. A number of discussions between AV Direct and both the artist’s audio engineers ensured that all technical equipment for the bands were correct. The night ended off with some great jazz in the form of UK singer Cole Page (Pictured Above). A funky DJ duo entertained the guests well into the night! It was really a splendid evening and an absolutely magnificent wedding to be a part of! Our client was extremely impressed with the professional technical look and feel of the venue. The entertainment was world class and everything ran so smooth. It was a huge accomplishment for us and inspired our team to be at its best. Whether you are planning a simple ceremony or a magnificent gala affair, AV Direct’s Wedding Services can help you create the destination wedding of your dreams.